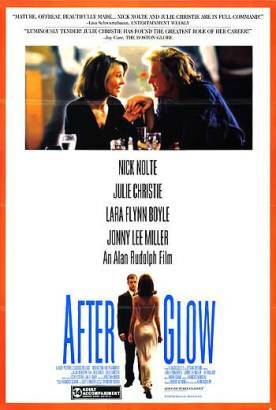 “Unclog any tubes today?” asks waspish wife Phyllis (Julie Christie) of her husband, Lucky Mann (Nick Nolte), a philandering plumber and handyman in Alan Rudolph's Afterglow. “Pipes. The word is pipes,” he insists, though we have just been watching him wielding his tool in such a suggestive way (“Turn me on” he says to a lonely woman in a state of deshabille as he lies on his back under her sink—“the hot water, I mean”) that we assume Phyllis knows what she's talking about. But the relationship between Lucky and Phyllis is not entirely what it seems. She is a former B movie actress who got pregnant by a co-star when Lucky was away in the Navy. She waited 15 years to tell him that the child, Cassie, whom he thought his daughter, had been fathered by another man. He took it badly. When the girl heard him shouting, “She's not mine,” she ran away from home. That was eight years before the action of the film. Lucky and Phyllis had received but one communication from her in that time—from Montreal—telling them that she never wanted to see them again. So had they moved to Montreal and started looking for her, so far without success. At the same time they had stopped having intimate relations and come to an arrangement that Lucky could seek sexual satisfaction elsewhere. Phyllis now spends her life watching her old movies on television and imagining that she catches glimpses of the missing Cassie on street corners. It's all too deep for me, I'm afraid. Soon she has agreed to go away with him for the weekend. But though Jeff and a business rival are both powerfully attracted to her, she manages to keep her mystery intact. At this point neither knows that his or her spouse is seeing the other's—nor do their spouses know it. Predictably enough, they find out and there is an explosion. Will Marianne, now carrying Lucky's child, make the same mistake as Phyllis in the same circumstance? Will Phyllis and Lucky, who obviously love each other still, patch up their marriage again? Will the missing Cassie ever turn up? The answers to these questions are of less compelling interest than they would be if the dramatic tensions had been better managed. Both Jeff and Cassie, whose contributions to those tensions are so central, are ciphers—emotionally missing in action—so we are always more or less in the dark as to where all the rest of the film's emotions are coming from. But Rudolph obviously designed it as an actors' film, with good meaty parts for all four of the principals. The lack of dramatic coherence is therefore not so troublesome as it might otherwise have been. In fact, the picture is worth seeing if only for the performance of Julie Christie—who, like poor Cassie, has been gone too long.